This is not the first this nonsense has been suggested. I do remember when it was advanced over 10 years ago, at that time it was generally dismissed and or derided . Once again, Those who cannot beat the donkey instead hit the saddle, i.e, instead of addressing the real socio- economic issues…. As always the religious moral questions are raised , in reference to some of our neighbors where the practice is legally promoted. It is interesting that it is mentioned that israel has been discussing the issue as well. One of the commentators brings up a valid point… if a man cannot sustain a single spouse family, how will he sustain multiple families. The unanswered question. How many is polygamy, 2,3,4 or 40? It has been reported that may do in fact practice it, many expatriates already have wives and children in their respective countries of habitation. Note. Polygamy is a general term meaning having multiple spouses. Multiple wives is polygyny and multiple husbands is polyandry. Suggestions by at least one sociologist to introduce polygamy as a means on how to solve the dire demographic issues Christian Armenia is severely challenged with has raised something close to a public tornado. Some, however, are convinced that Armenia should consider the issue, just as Israel, where introduction of polygamy is being discussed as a possible countermeasure against the demographic expansion of Muslim countries. Armenia is, indeed, on the verge of demographic crisis &#150; birthrate has seen 50 percent decrease and immigration indexes have increased considerably. By UN Population Fund&#146;s (UNPF) predictions at this rate by 2050 the population of Armenia will be 2.3 - 2.5 million, when Azerbaijan&#146;s population will be doubled, reaching from today&#146;s 9 million to 18. Doctor, psychiatrist Harutyun Minasyan says solving social issues is not enough to meet the demographic challenge, because of infertility and the insufficient amount of men represented in the parenting demographic. &#147;It is a serious challenge for our country, mostly the families who have boys have left the country because of the war, and now young men are leaving the country because of social issues, this leads to quantitative imbalance between men and women of reproductive age &#150; this is the main reason why polygamy should be encouraged,&#148; Minasyan, heading Nor Arabkir health center, told ArmeniaNow. According to his data, the ratio gap between men and women of reproductive age will lead to further cut in birthrate. &#147;By non-official data, the ratio is one man to seven women, we have 60,000 women of reproductive age in Armenia (single, divorced and widowed), who can still have children, but because of negative public attitude they refrain from having children, and if polygamy is encouraged they can have legal children,&#148; says Minasyan. Another supporter of the idea, sociologist Aharon Adibekyan is calling &#147;to put aside fake morality of petty bourgeoisie for the sake of the nation&#146;s survival&#148;. &#147;The Armenian nation is on the list of declining nations in the United Nation&#146;s Population Fund report. Look at it pragmatically: we either stay loyal to our Christian values and fade away or reconsider our values and traditions for the sake of survival of our nation,&#148; Adibekyan told ArmeniaNow. 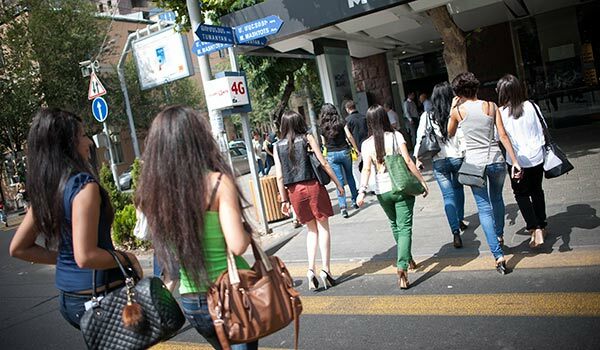 According to official data, the number of women and men in Armenia is almost equal - 52 and 48 percent respectively, however, Adibekyan claims that in reality there are currently much fewer men in the country. &#147;After completing the army service young men leave the country almost immediately because they can&#146;t find employment. If there is a long way to go for economic development, then the issue is going to be hard to solve, so we should allow at least those men who are in Armenia to have more than one wife and boost the birth-rate,&#148; says Adibekyan. According to him, every 10th potential bride is left without a couple, and having a child without first getting marriage is viewed as disgrace in Armenia. &#147;A child has to be born in a family, even if it&#146;s the second or third family [of the same man], beside the fact that illegal children are treated as bastards in our society, there are plenty of studies showing that children who grow up in father-less families are more prone to becoming criminals and drug-addicts. Hence, a full family is required, and if there are not enough men, there has to be polygamy,&#148; he says. The biggest issue is the infertility rate; by official data 20 percent of women are infertile, and as Minasyan says, &#147;if a woman can&#146;t have a child, no matter how many social projects the state implements, it won&#146;t help&#148;. &#147;By international standards, a country is on the verge of a demographic crisis when infertility rate reaches 15 percent, meanwhile in Armenia it is 20. They say in that case the solution is surrogate maternity, but it&#146;s not an option yet, since it&#146;s too expensive a &#145;pleasure&#146;,&#148; says Minasyan. Surrogate mother service in Armenia costs $25,000; by non-official data annually some 100 deals are made, however there is no data on how many children are actually born. The idea of polygamy in conservative Armenia is taken with sharp hostility, despite the fact that historically &#150; in pagan and early-Christian Armenia &#150; polygamy did exist, the Armenian royal court even had a ministry for the protection, training and education of the kings&#146; wives and children. &#147;It is not a solution, but futile talks by futile people, and if those short-sighted ill-judged ideas attract attention, we will also use our Armenian families, and that will be the end of it &#150; everything will collapse,&#148; says president of Armenian Social-Democratic Initiative NGO Ruben Yegoyan with outrage. He does not deny the serious demographic issues apparent in Armenia, but believes it is mostly because of social issues. &#147;It is not the lack of men that children are not born, but because of lack of sufficient means and unemployment. How many men can afford having two families and support them? It is not serious,&#148; says Yeganyan. United Nations Population Fund executive officer Garik Hayrapetyan is convinced that the issue is not based on a reliable research, and concrete statistical data on the gap in men and women ratio are required to understand whether polygamy is really necessary. &#147;First of all it has to be researched, it is wrong to suggest solutions based merely on emotions or assumptions. As for the future, it will not even be an issue, since we are going to have a reverse picture &#150; the number of boys will predominate and we&#146;ll have lack of girls,&#148; he told ArmeniaNow. The survey recently initiated by the Fund has revealed that selective abortions in Armenia have reached alarming scales, and as a result 50,000 more boys have been born in Armenia since 1993 than girls. &#147;These boys will soon become of reproductive age, and how are we going to have polygamy, if there soon will be 1.5 times more men among Armenian population than women? So talking about polygamy today is groundless, to say the least,&#148; says Hayrapetyan. Copyright &copy; 2002-2009 ArmeniaNow.com All rights reserved. Edited by Arpa, 25 October 2012 - 08:07 AM. One man for every 7 women? Edited by Arpa, 25 October 2012 - 12:42 PM.